Hungary adopted tough new rules allowing authorities to detain all asylum seekers, including women and children. BUDAPEST: Hungary adopted tough new rules on Tuesday allowing authorities to detain all asylum seekers, including women and children fleeing war and poverty, in border camps built from shipping containers. Human rights groups said the decision was a "flagrant violation of international law." In the eyes of Hungary's combative prime minister, Viktor Orban, an early supporter of U.S. President Donald Trump, migrants are a "Trojan horse of terrorism" putting his country under siege. He considers the migrants, many of whom are Muslims, as a threat to Europe's Christian identity and culture. 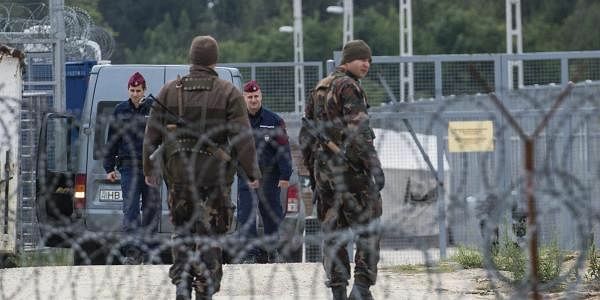 According to rules adopted Tuesday by lawmakers from his governing Fidesz party and the far-right Jobbik party, all asylum seekers will detained at camps built from shipping containers on the border with Serbia until a final decision is made on their asylum requests. Hungary intends to close all other refugee reception centers around the country. Police will also be allowed to expel to the Serbian side of the border fence any migrants who cannot prove their legal right to be in Hungary. Since July 5, only migrants found within 8 kilometers (5 miles) of the border could be sent back to Serbia. The developments alarmed human rights advocates. "Dumping all refugees and migrants into containers isn't a refugee policy — it's avoiding one," Amnesty International said, denouncing the Hungarian moves as a "flagrant violation of international law." It called on the European Union to step up against Hungary's "illegal and deeply inhumane measures." The United Nations refugee agency said the new law "violates Hungary's obligations under international and EU laws, and will have a terrible physical and psychological impact on women, children and men who have already greatly suffered." Speaking at a swearing-in ceremony for 462 new border guards, called "border hunters" by the government, Orban again focused on migration as a major threat. "Migration is the Trojan wooden horse of terrorism," Orban said. "The people that come to us don't want to live according to our culture and customs but according to their own — at European standards of living." Orban said the migration pressure on Hungary's borders would continue. "We are still, at this moment, under siege," he said. "The migration flow has only slowed but it is not over. We have gained time to strengthen our lines of defense." In Belgrade, the Serbian capital, migrants waited at an abandoned warehouse for a chance to continue their journey toward Western Europe. "For us, everywhere is difficult, because here we are homeless, we are innocent," said Hamid Khan, a migrant from Pakistan. "My friend told us that on Hungary border, they beat us and by dogs they bite us, that's why I don't try." On Monday, the Hungarian interior ministry again rejected a report in Swedish tabloid Aftonbladet in which a member of Doctors Without Borders said they had been treating migrants with injuries including dog bites and beatings, allegedly at the hands of Hungarian officers. The new rules expected to be enforced within days are linked to the state of emergency due to migration which has been extended by decree until Sept. 7. "There are hardly 400 asylum seekers in the country," said a statement issued by seven rights groups, including the Hungarian Helsinki Committee and MigSzol, the Migrant Solidarity Group of Hungary. "The extension of the state of emergency only serves to maintain the xenophobic, fear-mongering propaganda." While Orban has said often that Hungary will apply its Christian values to take in asylum seekers, very few achieve protection here and only around 16 a day are now allowed to apply for asylum at the border transit zones.